VLC Media Player is without doubt one of the most popular multimedia players. Part of the popularity comes from the fact that it supports nearly every media format out of the box, so that you do not need to go out codec hunting before you can play a video or audio file on your system. The developers are currently working on an Android version of VLC which we have reviewed yesterday. Today, an update for VLC for the desktop has been released. 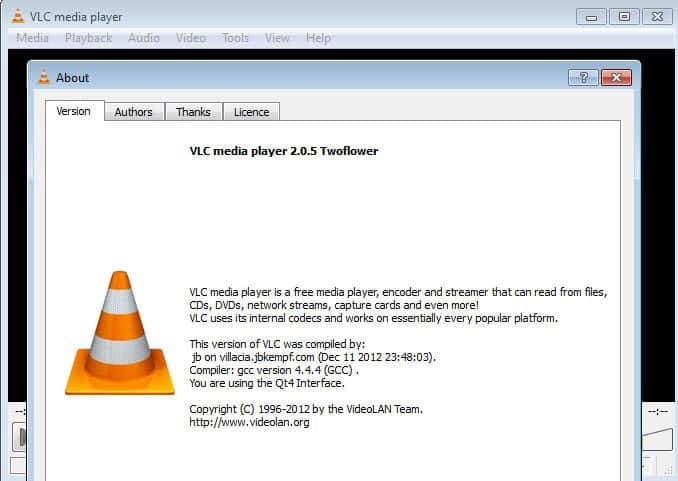 VLC 2.0.5 is already available on the home page of the VideoLAN website but not yet available via the program's update checker. When I run the update check on VLC 2.0.4 it tells me right now that it is the latest version. It is however very likely that the new version will get picked up soon by the program so that you can install it using the update checker if you wait long enough for that to happen. If you do not want to wait, download the latest version of the media player from the official website instead and install it manually on your system. The update as usual removes the old version of VLC Media Player from the system before the new version gets installed on it. The update is a stability update for VLC according to Felix Paul Kühne, lead developer at VideoLAN who posted a lit of notable changes made in version 2.0.5 on his personal blog. I have been using VLC Media Player for 1 year, approximately. It is really a very nice media player for it plays almost every media format. It is light weight and has a lot of features bundled with it, for free. I appreciate the work of the team and will expect more great work from them. Yes, update feature should be improved because not everybody has a lot of time to remove the earlier version then download and install the latest version. The program should do this job automatically as soon as the new version comes out. By the way, it is a great app. I will give 5 stars out of 5. Well, there was one thing I missed. I recently got my Windows 7 upgraded to Windows 8. I re-installed VLC Media Player, and there have been no glitches in it. It is working fine, for now. i love the VLC media player. its a great media player. Today i install the VLC 2.0.5 but i see some lag while playing 1080p videos, even some of the 720p videos have some shuttering. I don’t know whats the problem , these are working fine in previous VLC 2.0.4. But Overall this is great player. I hope VLC team will fix them soon. MPC-HC 1.6.5, superior player and not bloatware like VLC garbage. I prefer PotPlayer from Daum Comms Corp. It’s available in 64-bit. The player is known as The KMPlayer previously. Both players are developed in Korea but are unrelated projects. BTW I just updated my old (rarely used) KMP version and the the new installer was unusually tricky as far as trying to add toolbars and other spyware to your system. NEVER blindly accept “recommended” installations with any of these tricksters.